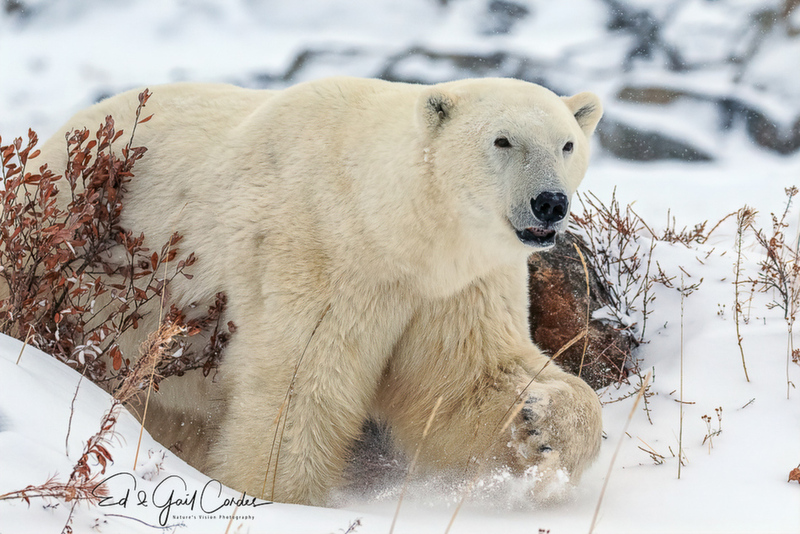 This was a wonderful encounter with a polar bear in Churchill Manitoba. The bear came by to see what the ruckus was when we were photographing a local sled dog. 7D2 and 100-400 @ 214 mm. I love the way the left paw is kicking up the snow. Love everything about this! Yes, the left paw takes it to the next level. Great work! Me too, the raised paw makes it. Congrats. Yep the snow flying from the paw really sets this apart. Nice that you had some snow there. I couldn't agree more, Ed! The slight head turn, the raised paw and flying snow, and the colour provided by the wisps of vegetation - everything comes together so well. A wonderful experience and a great image to show for it. Well done! This is totally awesome! Great paw, as noted, and love the way the bear is emerging from the brush and snowbanks. Top notch! Wow super portrait Ed, love the foot with the spray of snow beneath it as well. Thank you to the Editors and Moderators for recognizing this image as an EP. It is an honor to be among so many other great photographers. Love the swinging paw with the flying snow.